If you're a true pizza lover, you're going to love this one too to the core provided you're a non-vegetarian as well. The two primary ingredients used for the topping are king prawns and fresh cherry tomatoes. The recipe itself is dead simple yet tastes heavenly. You can definitely spice it up and can also add more to the topping. You may notice there's no creamy sauce base used in the topping which makes it quite different than a typical pizza preparation. If king prawns are not available, use the local variant or replace them altogether with your favorite seafood. If possible, use a wood fire oven to get the best results. So, here we go to make this simple yet delicious pizza that'll liven up your taste buds. 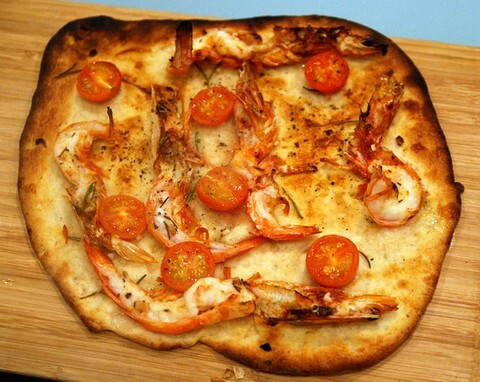 Enjoy this delicious and easy-to-make pizza preparation which includes mouth-watering king prawns with cherry tomatoes and select flavoring ingredients. Add prawns in a bowl and season with white pepper powder and salt. Add 1 tsp of olive oil and lime juice as well. Mix well with your hands ensuring the seasoning is applied well on the prawns. Keep aside for half an hour. Meanwhile, work on the pizza dough. Add semolina and sea salt in the bread flour and sift for a minute. Mix sugar and yeast in 3 tsp of water and add in the sifted flour. Add extra virgin olive oil as well and mix in the flour. Slowly start adding lukewarm water and knead the flour into nice and spongy pizza dough base. Cover with a damp cloth and keep in a dark warm corner for about an hour. Sprinkle some flour on the pizza rolling base. Spread the dough in a ball shape and roll into a quarter inch thick pizza base. Place both tangy and seasoned prawns and sliced tomatoes on the base randomly. Sprinkle dried herbs, garlic powder, onion powder and a pinch of salt on top. Bake in a preheated oven at 180 degrees for about 8 minutes. Cut in your desired shape and serve hot.